McCarthy Tétrault is pleased to welcome 16 new lawyers to the firm’s partnership. Our new partners have demonstrated top-tier legal expertise, strong business acumen and exceptional leadership within their practices. They reflect the strength of our expertise across practices, industry groups and regions, as well as our firm’s commitment to the success of our clients. Tina Benson (London, UK, Business Law) has a hybrid business law and dispute resolution practice focused on debt and equity capital markets transactions and the resolution of commercial contractual dispute resolution in the High Court and by international arbitration. Cristian Blidariu (Toronto, Business Law) is a member of the firm’s Securities Regulation & Investment Products group and maintains a securities regulatory practice, with particular emphasis on the regulation, development and merger of retail mutual funds. Élisabeth Brousseau (Québec Region, Litigation) has a litigation practice focused on commercial litigation, class actions, as well as professional and medical liability. Gordon Cameron (Calgary, Business Law) has a transactional practice focused on corporate finance and securities, mergers and acquisitions, corporate governance, and general corporate matters. Heidi Gordon (Toronto, Business Law) has a practice focused on mergers and acquisitions, capital markets, and private equity transactions. Andrew Kalamut (Toronto, Litigation) has a litigation practice focused on disputes in the mining industry, construction/infrastructure disputes, and professional negligence. Kosta Kalogiros (Toronto, Litigation) has a broad litigation practice with experience in all manner of disputes (corporate/commercial, professional negligence, real property, product liability, and estates) and has particular expertise in the auto sector where he advises on regulatory matters, litigation/risk management, and autonomous vehicles. James-Scott Lee (Calgary, Business Law – Financial Services) has a broad lending practice encompassing syndicated bank transactions, cross-border financings, and acquisition financings. D.J. Lynde (Toronto, Business Law – Financial Services) has a financial services practice focused on banking, secured lending, cross-border, private equity, securitization and structured finance transactions. Ian Mak (Toronto, Business Law – Financial Services) has a financial services practice specializing in all aspects of banking and secured lending, including leveraged buyout and recapitalization transactions, syndicated financings, subordinate and mezzanine lending, bond financings, asset-based lending, cross-border and multi-jurisdictional financings, and general credit matters. Hadrien Montagne (Québec Region, Business Law) has a transactional practice focused on mergers and acquisitions, securities law, corporate finance, and corporate governance. Mary Pagonis (Québec Region, Real Property & Planning) has a broad commercial real estate practice that includes real estate financing, commercial real estate transactions, construction and development projects, and commercial leasing. Tina Peters (Calgary, Real Property & Planning) has a general commercial real estate practice with a focus on commercial acquisitions and dispositions, financing transactions, and commercial leasing. Gillian Piggott (Vancouver, Real Property & Planning) has a commercial real estate and municipal practice focused on property acquisition and development, real estate financing, and municipal land use issues. Adam Ship (Toronto, Litigation) has a practice focusing on complex commercial litigation and franchise-distribution law, and leads the firm’s Franchise & Distribution practice. Steven Tanner (Toronto, IP Litigation) has a patent litigation practice focused in the areas of pharmaceutical patent litigation, oil and gas patent litigation and telecommunications patent litigation. McCarthy Tétrault LLP provides a broad range of legal services, advising on large and complex assignments for Canadian and international interests. The firm has substantial presence in Canada’s major commercial centres as well as in New York City and London, UK. 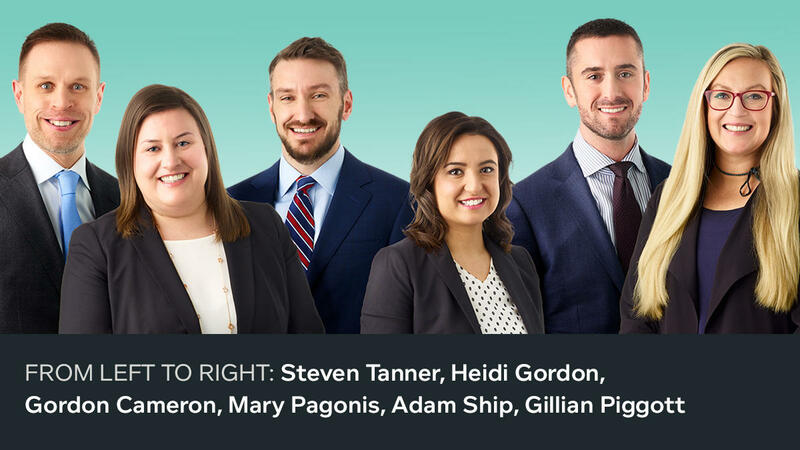 Built on an integrated approach to the practice of law and delivery of innovative client services, the firm brings its legal talent, industry insight and practice experience to help clients achieve the results that are important to them. For further information, go to www.mccarthy.ca.